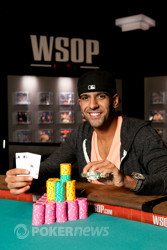 Ronnie "RoNasty" Bardah raised on the button and Marco Johnson reraised from the big blind. Bardah called and the flop produced the . Johnson led with a bet and Bardah called. The landed on the turn and Johnson bet out again. Bardah called once more, this time to see the land n the river. Here, both players checked. Johnson said he had king high and Bardah nodded. Johnson showed the and Bardah mucked his hand. 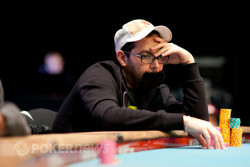 Ronnie Bardah check-called a bet from Marco Johnson on the flop before the dealer placed the out on the turn. Both checked and the turn was the to pair the board. Bardah bet and Johnson folded. 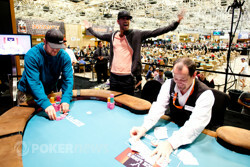 On the flop, Marco Johnson check-raised a bet from Ronnie Bardah and Bardah called. The turn was the and Johnson bet. Bardah raised and Johnson called. The river was the and Johnson checked. Bardah bet and Johnson folded. 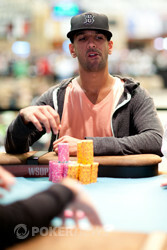 With that pot, Bardah has moved himself into the chip lead. 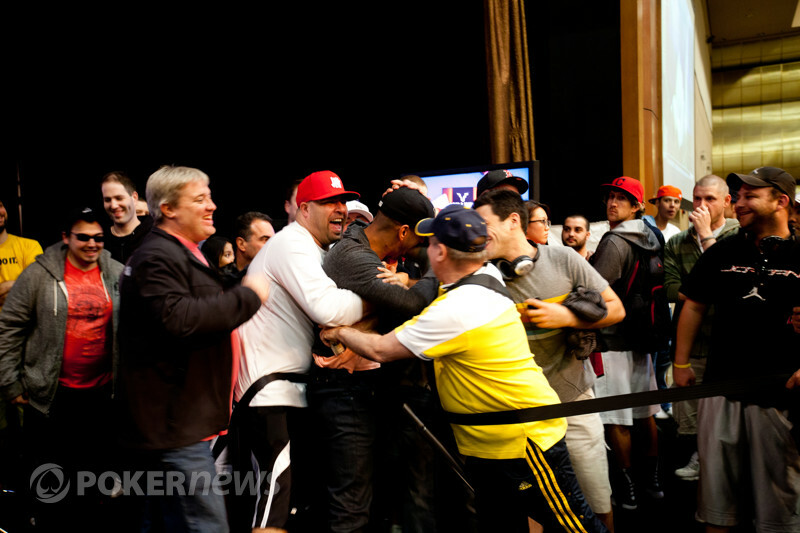 Just before the heads-up battle began, Ronnie Bardah gave a shout to his supporters, and they responded in kind. The scene quickly grew quiet, however, as the pair's duel commenced. Soon a hand arose in which Johnson raised from the small blind/button and Bardah called. The flop came , Bardah checked, Johnson bet, Bardah check-raised, and Johnson called. Bardah then led with a bet following the turn, and Johnson called. The river brought the and one more bet from Bardah. Johnson called again, then mucked after Bardah tabled his . 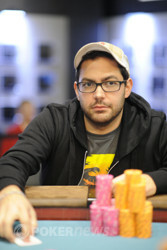 Vincent Gironda battled valiantly with his short stack since the players returned from dinner break, surviving being all in a couple of times with a chop and a win. Then came a hand in which Gironda called down bets by Marco Johnson on each street as the board came . 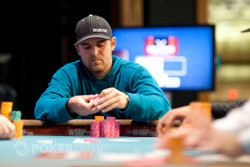 Johnson tabled for aces and Gironda mucked, leaving the latter with about 80,000. 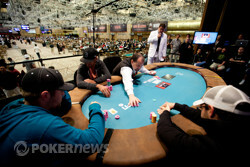 Soon Gironda engaged in a series of preflop bets with Johnson, and Gironda was all in again. Gironda was the one with this time, and he was hoping his hand would hold versus Johnson's . But the flop came to pair Johnson. The turn was the and river the , and Gironda's Event 40 run ended in third place. "18-to-1 and 20-to-1!" 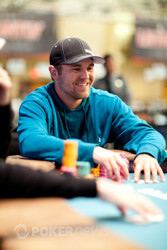 said Johnson to Bardah with a smile as they readied for heads-up play. Johnson was referring to the betting odds on the two of them to start play today. Having put some money on either would've been a nice bet today — they were 9th and 10th out of 10 in chips to start the day! 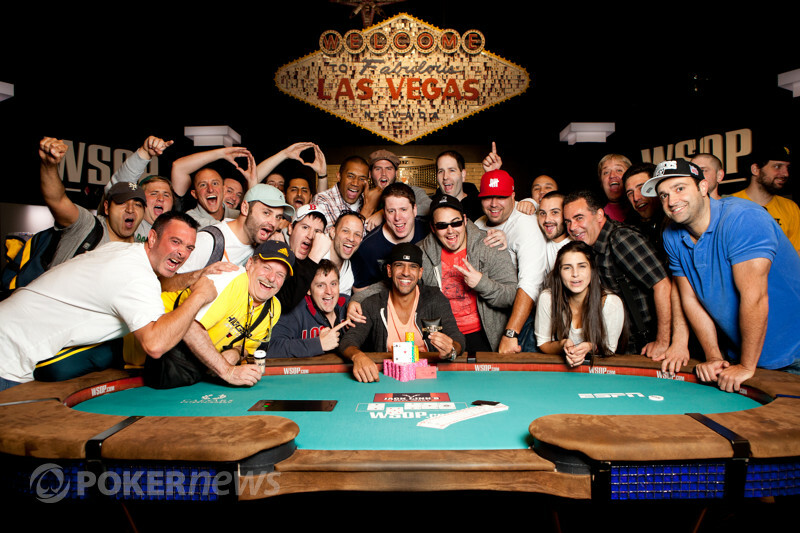 From the button, Marco Johnson raised and Ronnie Bardah three-bet from the small blind. Johnson called and the flop came down . Bardah bet and won the pot. After the shortened dinner break, Marco "Crazy Marco" Johnson and Ronnie "RoNasty" Bardah have been battling back and forth while Vincent Gironda just takes a view from the sidelines. On the first hand, Johnson raised from the button and Bardah three-bet from the small blind. Johnson called and the flop came down . Bardah bet and Johnson raised. Bardah reraised and Johnson called. The turn was the and Bardah bet. Johnson raised and Bardah made the call after a little bit of thought. The river then completed the board with the . Bardah checked and Johnson bet. Bardah gave it up and Johnson won the pot. After that, the two were in action on the flop with Johnson checking the action to Bardah. Bardah bet and Johnson check-raised. Bardah called. The turn was the and Johnson fired a bet. Bardah called. Then the river came and Johnson bet again. Bardah called, but mucked his hand after Johnson turned up the for two pair, kings and queens. On the very next hand, Johnson raised from the small blind and Bardah defended with a call in the big blind. The flop came down and Johnson led with a bet. Bardah raised and Johnson called. The fell on fourth street and Johnson passed the action to Bardah, who fired a bet and got called. The river was the and Johnson checked. Bardah bet and Johnson folded his hand. From the button, Vincent Gironda raised. 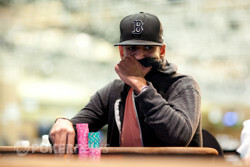 Marco Johnson three-bet from the small blind and Ronnie Bardah called from the big blind. Gironda called as well and the flop came down . All three players checked the flop and the landed on the turn. After Johnson checked, Bardah bet. Gironda called and Johnson folded. The river card was the and Bardah checked. Gironda bet and Bardah check-raised. Gironda called and Bardah turned over the for queen high. Gironda showed the for a king-high flush and won the pot. Ronnie Bardah three-bet from the small blind after Marco Johnson raised on the button. Johnson called and the flop came down . Bardah bet and Johnson called. The turn was the and Bardah fired again. Johnson raised and Bardah fired right back with a reraise. Johnson called. The river was the and Bardah bet out. Johnson quickly called. Bardah showed the for top set and Johnson mucked his hand.